You may click on the images for a larger version. Since 1992 we have spent every single day possible on the water and/or on the island during the months of October through January and the first week or two of February. We sample 4-5 hours every morning, more if possible; this Oct we covered every single day except for 3 separate days due to high wind/seas. This curve diminishes as the season progresses, by February the shark are noticeably scarce despite the high number of seals. While waiting for sharks to expose themselves at the lure we keep a sharp look out from atop the boats wheel house. 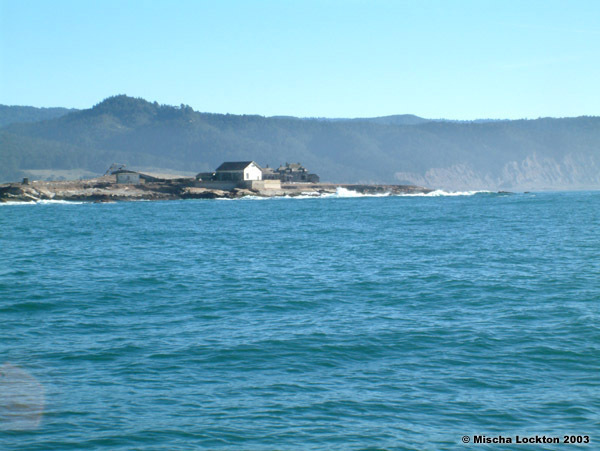 All pinniped traffic, bird activity, and surface commotions are carefully scrutinized. We have learned the favored routes of incoming and outgoing pinnipeds (seals/sealions) and will position our line of drift to intersect with these zones of high activity. When something interesting occurs, close attention is directed at the action. 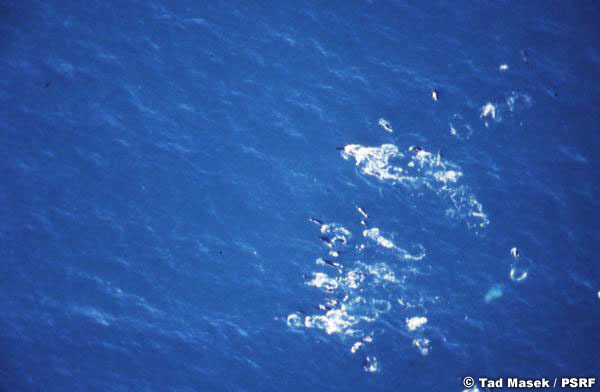 When a predatory event is detected or anticipated, the lure is recovered and the research boat carefully positions for action. 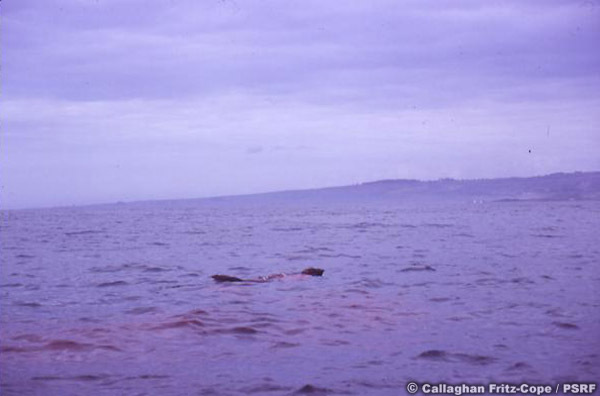 Left: a large adult female estimated 3.2 meters and half a ton has been observed to surface a mere 100 yards out; the seal has apparently been bitten, 0810 (am) it looks like there’s blood in the water. The seal abruptly dove at 0811 leaving a big splash and footprint upon the water. At 0814 (am) the seal is observed to re-surface approximately 60 meters away from our boat which is still positioned a short distance from where the seal had last been seen. The seal is clearly distressed this time and appears to have been bitten again. 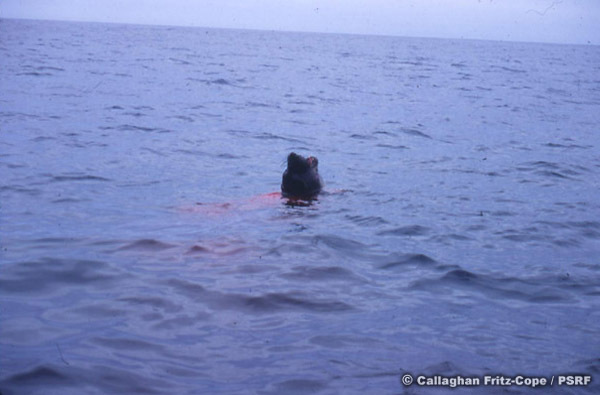 The seal makes circles briefly at the surface and then plunges into another dive. The seal’s efforts appear labored and she looks exhausted. Right: (vid-grab/long-lens) At 0821 the seal is again observed to surface a few hundred meters away from the last sighting somewhat closer to shore behind us; this time the seal has clearly been badly hit again, and mortally this time. 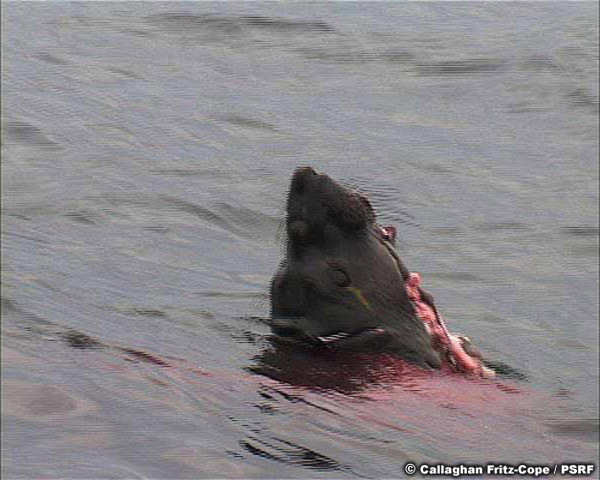 At 0824 the boat has been positioned approximately 30 meters away as the large seal sputters around in slow circles hemorrhaging from a series of bites delivered to the seal's head and neck; the seal is deeply lacerated and its massive lower mandible has been fractured. 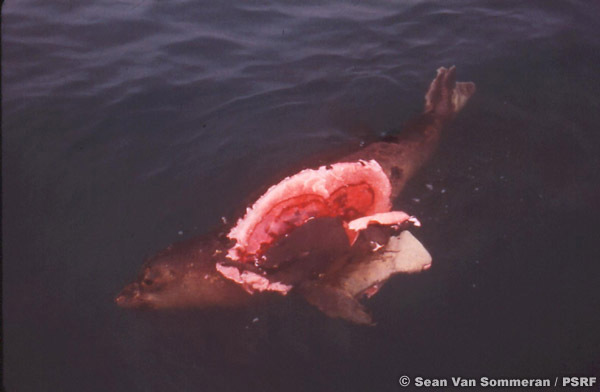 At 0828 the seal feebly dove again, it had only just vanished from site when a large shark surfaced with the seal’s head and neck completely engulfed. 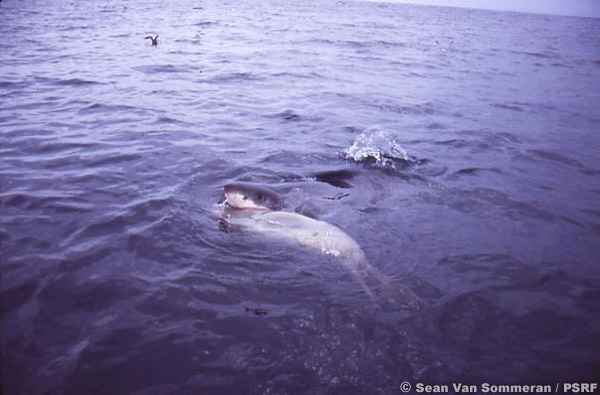 The shark slowly swam across the surface with the still twitching seal held in it's jaws. The shark carried the seal under and disappeared; flashes seen down in the deep, below us, suggested that the shark was now having its way with the large seal. 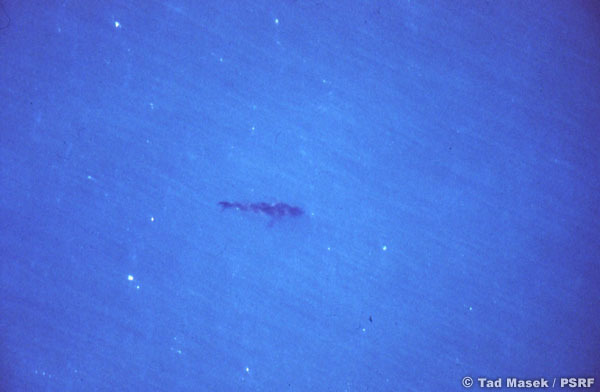 A large slick developed which was at least 100 meters across. That seal never made back to the surface again. 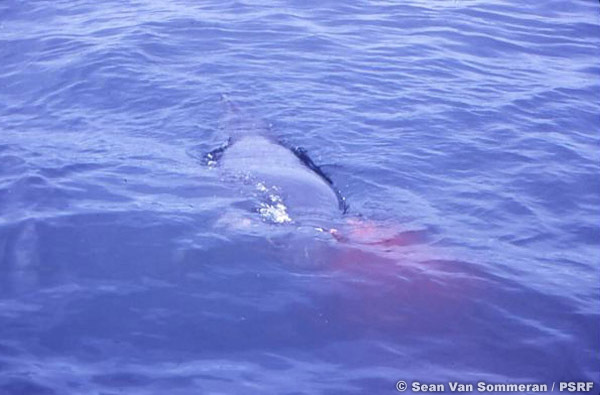 The shark had deep scratches on the snout and side of face. White tooth scratches on the sharks hide look like chalk marks. A few scratches were actual cuts with faint traces of bleeding. The lure was re-introduced within the slick after 20 minutes of quiet and the shark briefly reappeared to investigated the lure. 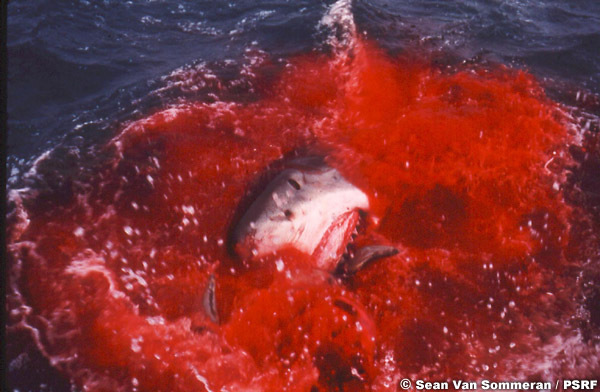 The shark was confirmed as an estimated 5.5 meter adult female white shark displacing close to 2 tons. 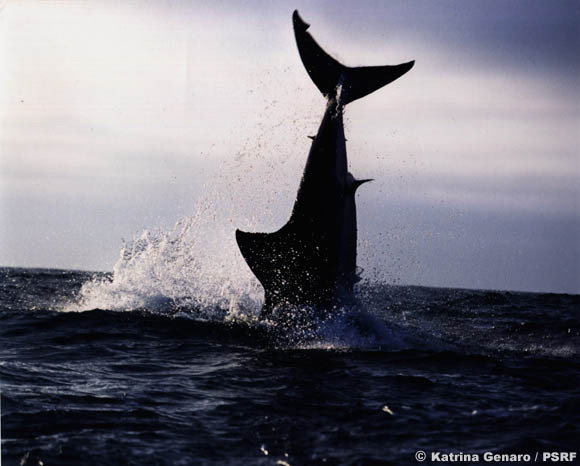 White shark predatory behavior is an interesting topic about which there is much debate. Many of the most cherished and conventional theories have been disproved in the past few years. Just knowing how to observe and understand white shark behavior is a topic of debate. 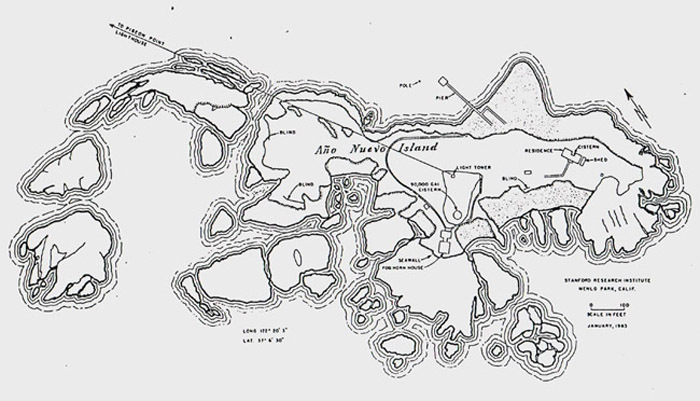 Formerly most observations were made either from a cage with chummed-up and fed sharks or from land based observers peering from an elevated position on an island. The cage diving venue was more an extreme sport activity to which 'visiting' scientists would briefly make some observations of white sharks being fed and or teased. In the early days this was the closest scientists ever got to a live white shark; many scientist still pursue contact with white sharks through the old-school 'chum and anti-shark cage' routine as it is their only option. Feeding the sharks often involved provoking the sharks and mishaps were not uncommon. 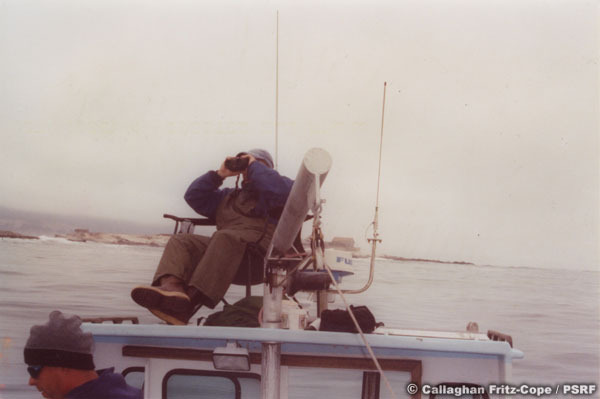 Innovative methods for studying white sharks were pioneered in California during the late 1980's at the S. E. Farallone Islands by noted Point Reyes Bird Observatory (PRBO) field researcher and naturalist Scott Anderson and his PRBO naturalist partner and globally respected marine bird expert Peter Pyle. The use of un-baited lures (surfboard) and photo ID methods produced some amazing results and the understanding of white shark behavior made a huge leap forward during this time. Noted elasmobranch scientist and marine science pioneer A. Peter Klimley was mentor and valuable contributor in establishing S.E. 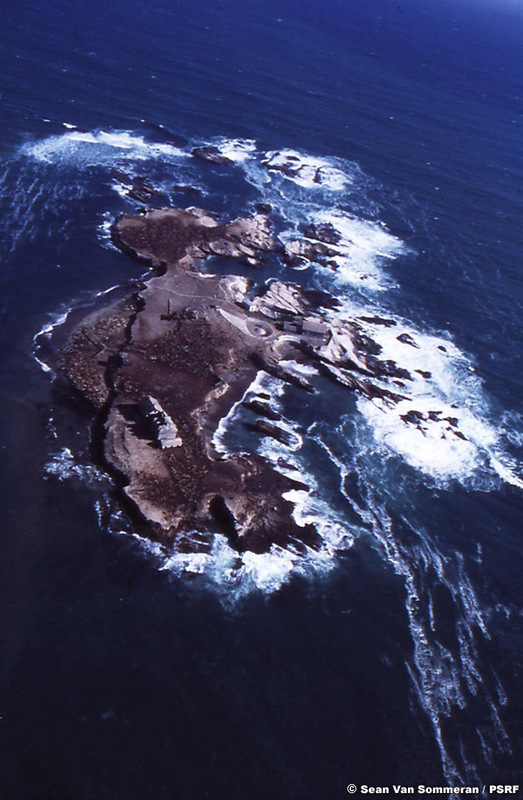 Farallones as a world class research site during these early years. 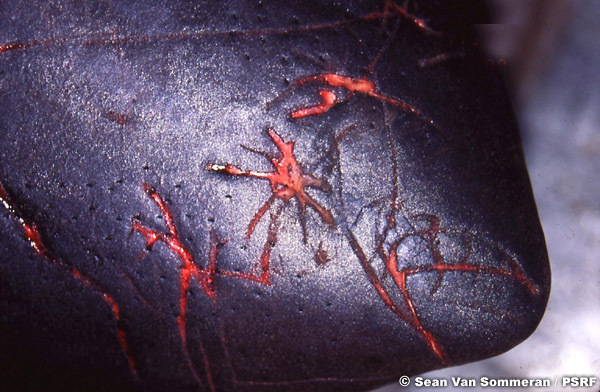 Without using cages or chum the Farallone researchers made many amazing new discoveries. 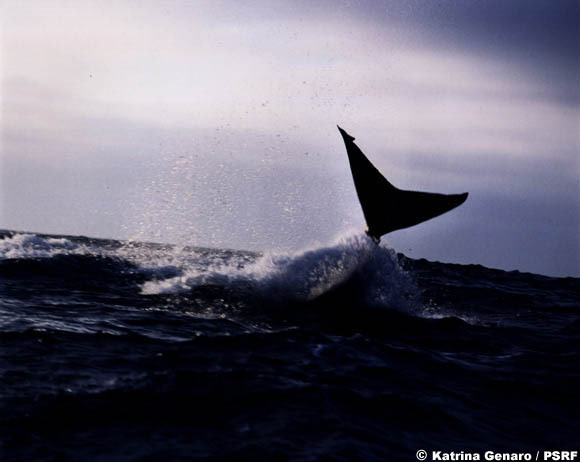 In 1992, the Pelagic Shark Research Foundation began conducting observations and lure experimentations. Not all attacks occur on surface bound prey items, rather they are quite often initiated sub-surface, especially with regards to deep diving seals which spend relatively little time at the surface. 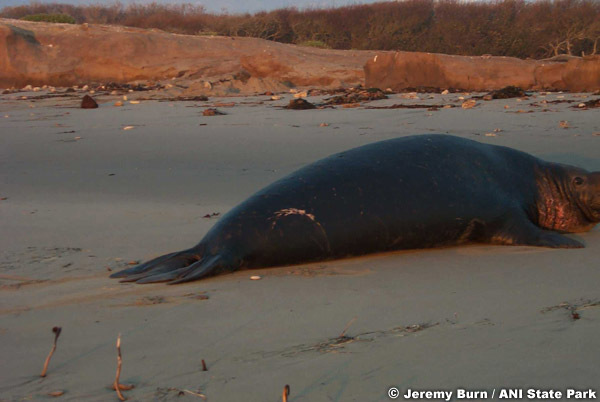 Seals like the northern elephant seal are often assaulted while at depth with the struggle graduating to the surface after the initial contact has already been engaged. At this point an observer may mistakenly assume the attack has just occurred when in fact it has only just then come to the observer's attention. 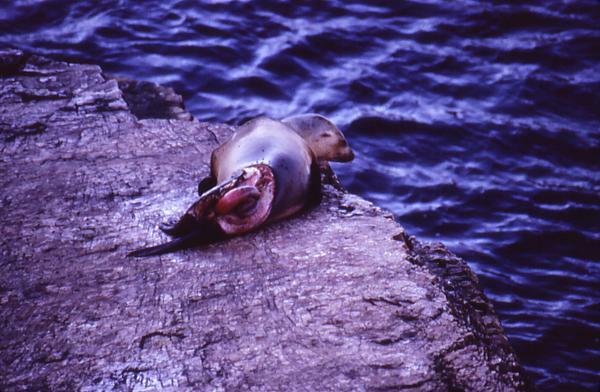 Below; A mortally injured California sea lion hauls out on the rocks after having been badly hit by a shark which has bitten off the sea lion's tail section. 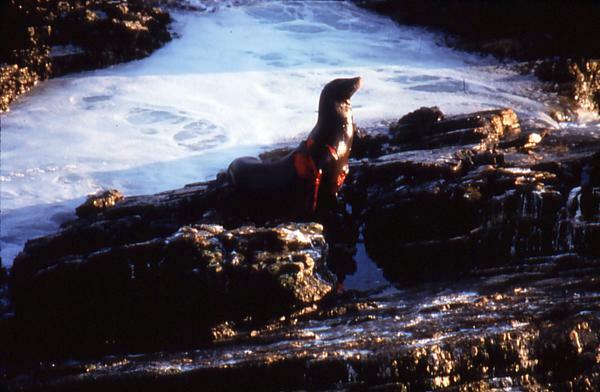 below; A badly mauled California sea lion makes it clear of the water, such hits upon California sea lions often occur near or at the surface where the sea lions spend most of their time while traveling or resting, such strikes often send both predator and prey out of the water in a dramatic breach event. 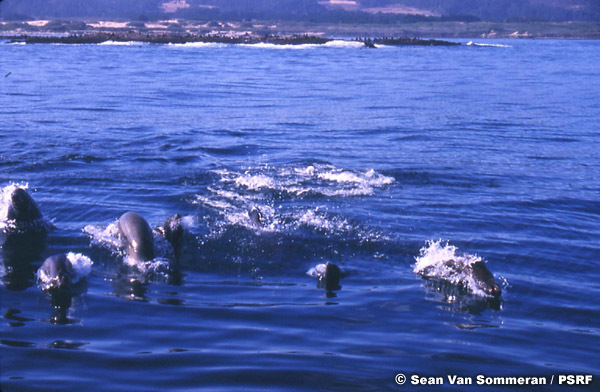 California sea lions porpoise across the surface, pushing hard for the safety of the island. 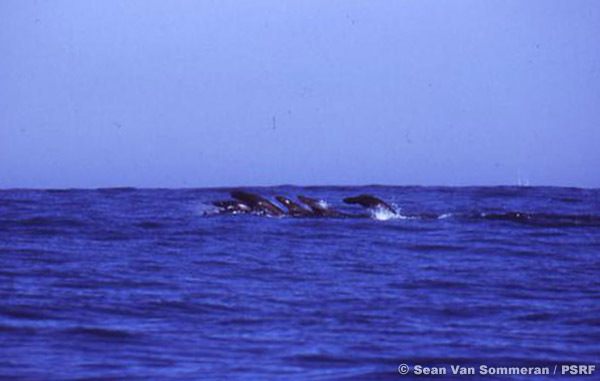 Sealions will often gather up in fast moving groups while departing the island and on final approach. 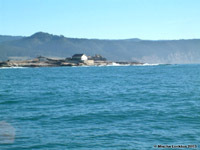 Often by watching traveling sea lions you can discern by their behavior whether or not they are being stalked or pursued by a shark or sharks. 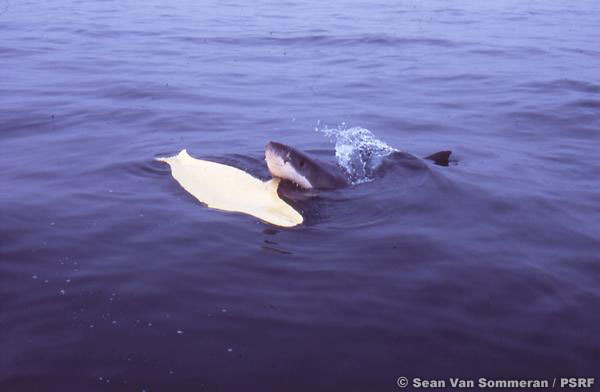 This behavior was first photo documented in California during the mid 1990's by PRBO field researcher Scott Anderson; since then the behavior has been noted and documented to occur in South Africa, in particular; it is now known to be a common predatory capability of white sharks. 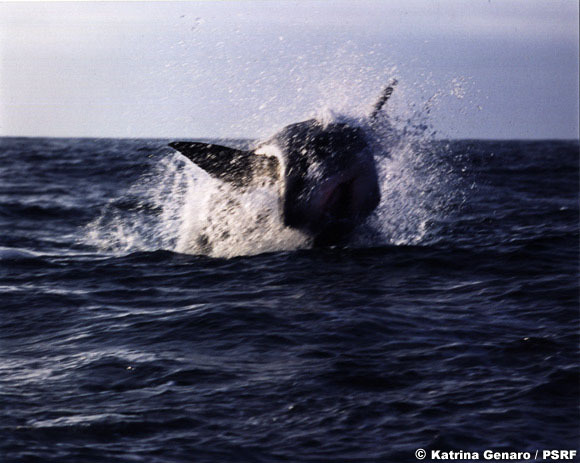 At first, many scientists thought that white sharks did not breach or that they only breached at Seal Rock in Africa. 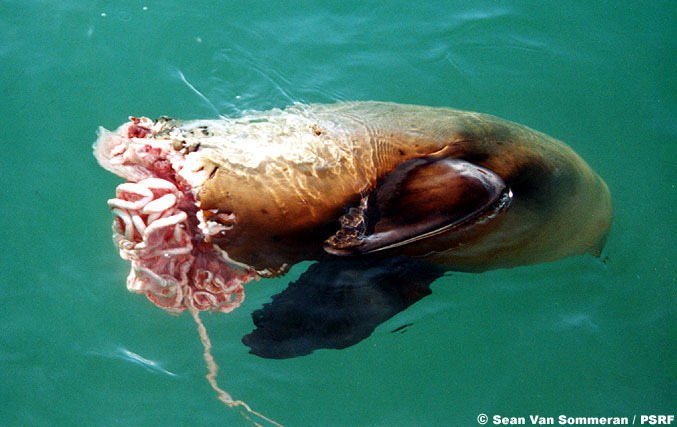 Below; This California sea lion was bitten in half by a high-flying white shark which breached among a small group of porpoising sealions. Another day at the office (R/V Mavrix); Callaghan Fritz-Cope with shark 006.